Robert Nesta "Bob" Marley (February 6, 1945 – May 11, 1981) was a Jamaican singer-songwriter and musician. He was the lead singer, songwriter and guitarist for the ska, rocksteady and reggae bands The Wailers (1964–1974) and Bob Marley & the Wailers (1974–1981). Marley remains the most widely known and revered performer of reggae music, and is credited for helping spread both Jamaican music and the Rastafari movement (of which he was a committed member), to a worldwide audience. 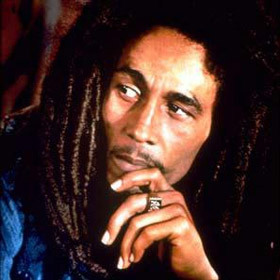 Marley's best known hits include "I Shot the Sheriff", "No Woman, No Cry", "Exodus", "Could You Be Loved", "Stir It Up", "Jamming", "Redemption Song", "One Love" and, together with The Wailers, "Three Little Birds", as well as the posthumous releases "Buffalo Soldier" and "Iron Lion Zion". The compilation album, Legend, released in 1984, three years after his death, is reggae's best-selling album, being 10 times Platinum (Diamond) in the U.S., and selling 20 million copies worldwide.